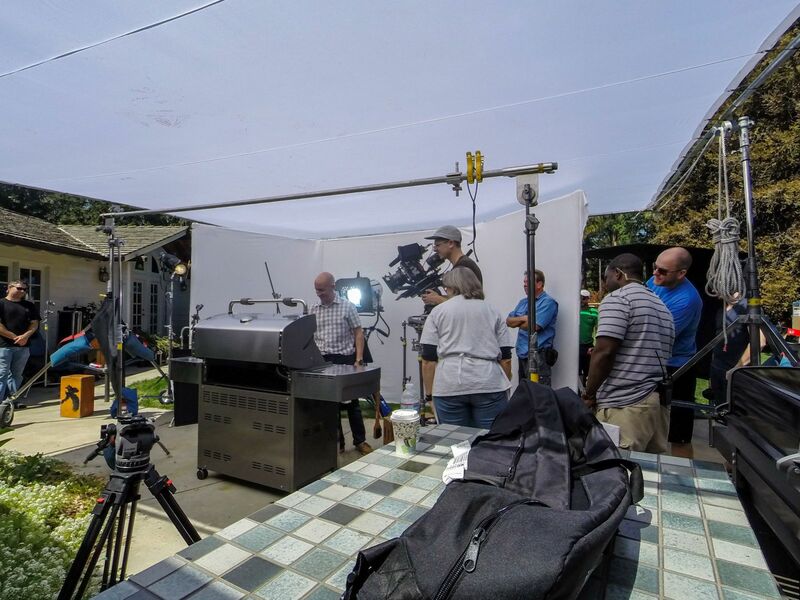 Earlier this spring, I traveled to LA to work on Weber’s latest television commercial, which debuted in select markets in May. Over the course of my week out west, I was fortunate to work with Marsha Capen, the Managing Editor of Weber’s cookbooks. Together we spent hours of grilling over three days of filming. We conquered grocery stores, backyards, and even a church parking lot. It was intense, it was crazy, and as with most high pressure cooking moments, I loved every minute of it. Our mission was simple, make the grilled food look great. No Hollywood magic. No post production special effects, just great food grilled on a fleet of Weber grills. Of course, in order to have great grilled food, we first needed great food. Marsha and I spent hours in grocery stores in and out of LA looking for the finest ribs, chickens, and steaks we could find. 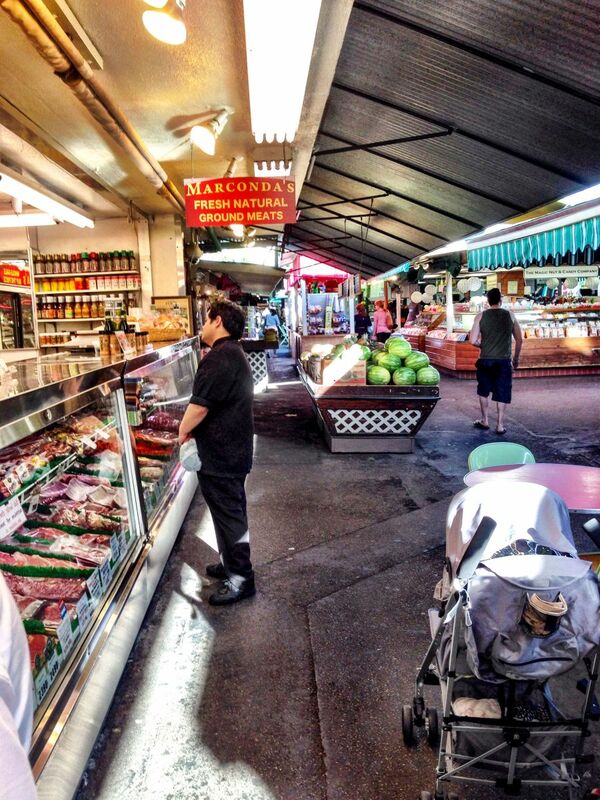 Marconda’s, located at the farmer’s market at 3rd and Fairfax, had the most exquisite selection of meat. I can still see the four dry aged prime porterhouse steaks, as they were hoisted onto the scale. Although a band was entertaining nearby in the market, all I heard was a choir of angels. The meat moved me. As we parked at our hotel, I explained to the valet we needed access to the car, since we needed to add more ice to the coolers. W cracked the cooler lid, and I’m fairly certain the valet was expecting to see a body. It was Hollywood after all. 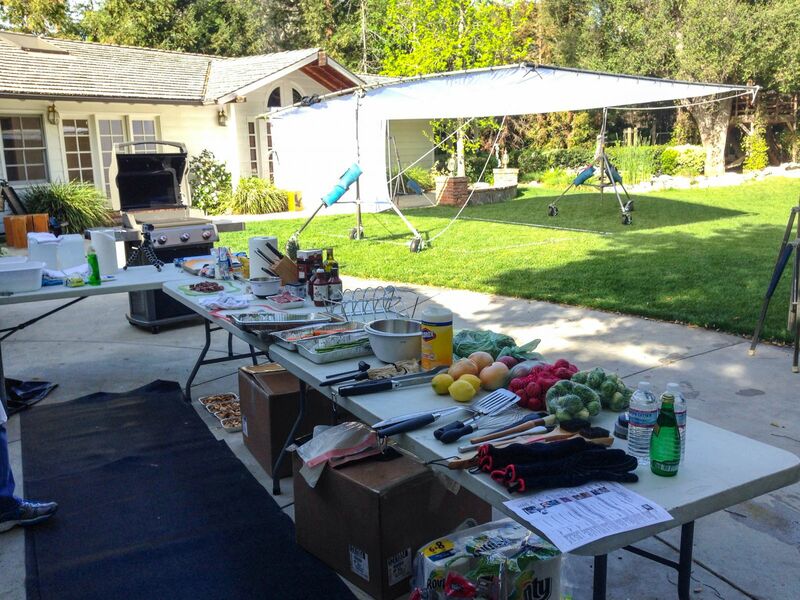 On our first day of filming, we set up shop on portable tables in a backyard rented out from the homeowner. Our cook schedule and times were the metronome of the day. With several different vignettes set to be filmed, we had to have the right food ready at the right time. Grilled steaks here, some rotisserie chickens there. Not only did the talent have call times, so did the ribs. One thing was obvious as we grilled. 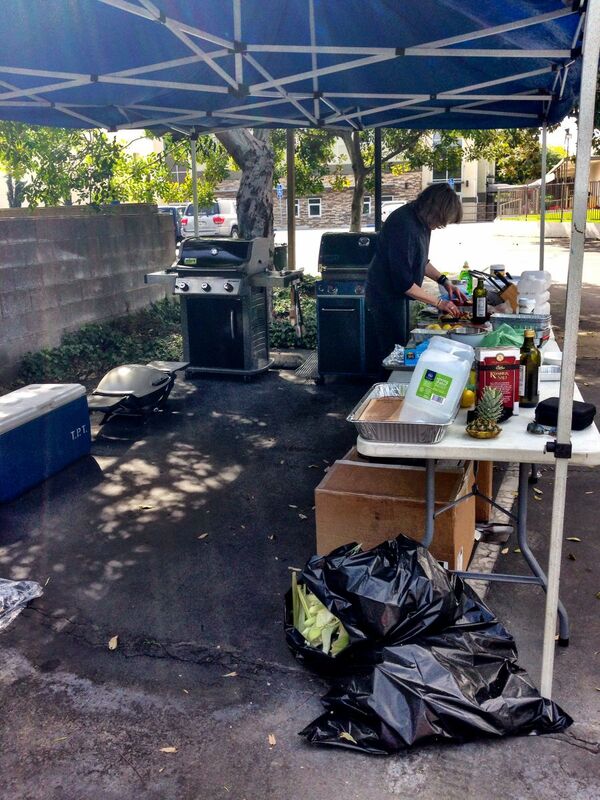 The crew was hungry, and found it quite necessary to walk by our prep tables as the day went on. Once some strip steaks were grilled and filmed, they were sliced and eaten. It was a fairly efficient process from cooler to grill to camera to stomach. 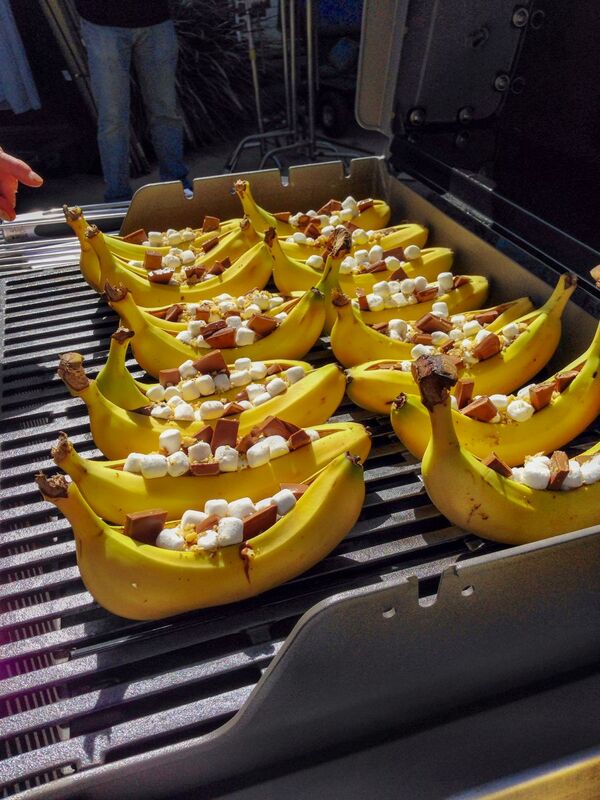 We also assembled the largest banana boat army ever. As we prepped the boats, I went through the build process as the camera filmed above. As soon as we were done, we grilled them as a special dessert for lunch. As the afternoon started, there were lots of sticky hands smeared with telltale bits of marshmallow and chocolate. 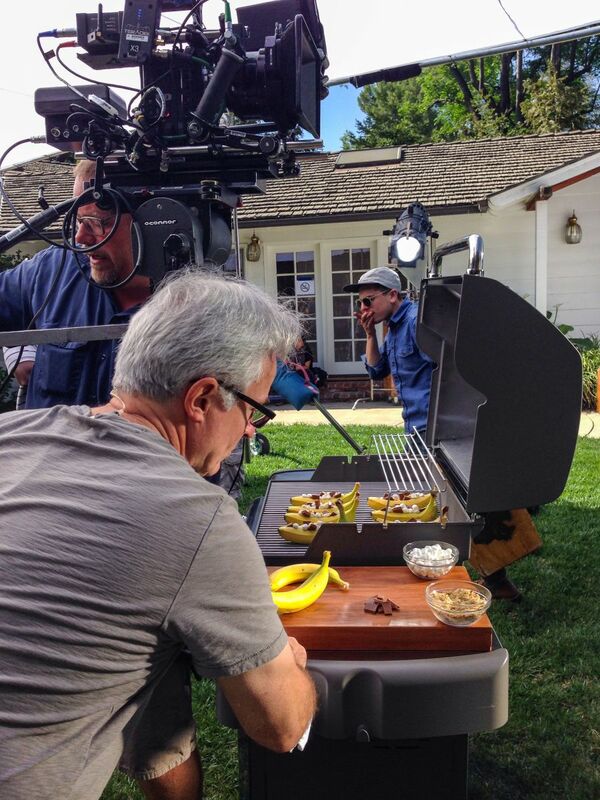 While the actors and actresses did their thing, I had one more mission: “grill talent.” When a close-up was required showing a steak flipped, coals being dumped, or as in the case above, banana boats being built, I was the guy. Yes, you have seen those feminine looking wrists before…and the grill marks. The third and final day was the most rewarding. The closing scene is a party. 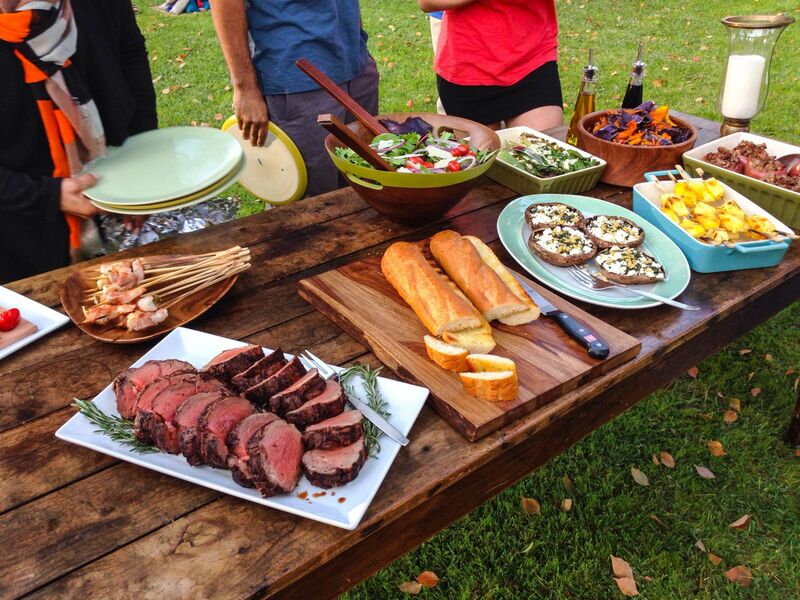 The central element is a table full of grilled food. We had to fill it. Unfortunately, the fire code forbade any live fire on set, which meant we had to grill in a backup location: a church parking lot. Huddled under a temporary tent, guarded by a curiously hungry security guard, and armed with a Weber Q, Genesis, and Spirit, we went about our work. In three hours we grilled beef tenderloin, sausage stuffed apples, planked pepperdews, pineapple, zucchini, onions, peppers, leeks, asparagus, romaine, corn, planked portabellos, and prosciutto wrapped skewered shrimp. As our deadline approached, we wrapped everything up and transferred it to the set. With help from our team, we plated the food and set the table. If we were asked once, we were asked ten times, “Is the food edible?” Our resounding and constant answer, “Yes!" We all huddled around the monitor to watch the last shot. As the director yelled, “Action!" the “partygoers" moved in to fill their plates. It looked amazing. While it may seem as though the partygoers were “acting,” I’m not really sure they were. As everything wrapped, and the crew started to strike the set, Marsha and I watched as the actors stayed seated at the party table. As if the camera was still rolling, they continued to laugh and feast on the food. It was that singular moment I will take away. Weber truly is serious grilling for unserious times. The actors were enjoying the moment. It’s what we all do with our Webers. Whether we are in our own backyards, or in a stranger’s backyard on the set of a commercial. It’s real, it’s unscripted, and it’s always fun. With no dishes to clean (thank goodness), Marsha and I left the shoot knowing the only thing well done was our work. The meat, of course, came out a wonderful medium rare. It was another awesome experience working with my friends at Weber and Rabble + Rouser. They are all consummate and dedicated professionals who are determined to bring only the best to your backyard. I’m proud to have been a part of their latest endeavor. Who Doesn't Love A Little Competition?